NRL Footy tipping comp is on! Loyal's NRL Footy tipping comp is on again. Free to join and open to everyone. Winner takes $200 cash. Get involved. Windows 7 and 8.1 hardware support ending? "At the same time, we know many of these customers continue to rely on Windows 7 for its well understood reliability and compatibility. Windows 7 was designed nearly 10 years ago before any x86/x64 SOCs existed. For Windows 7 to run on any modern silicon, device drivers and firmware need to emulate Windows 7's expectations for interrupt processing, bus support, and power states- which is challenging for WiFi, graphics, security, and more. As partners make customizations to legacy device drivers, services, and firmware settings, customers are likely to see regressions with Windows 7 ongoing servicing." So what does this all mean? Their main reason seems to revolve around the arguement of SOC (Systems On a Chip) technology. This has substantially changed the underlying architecture for which all modern systems operate and Microsoft do not want to continue to support newer technology on their dating operating systems. Considering Microsoft have committed to supporting Windows 7 with security updates and other critical fixes until January 14, 2020 and Windows 8.1 until January 10, 2023, this announcement seems to indicate they are bringing forward the support end of life for Windows 7 and Windows 8.1. Microsoft are aiming this change squarely at the enterprise. Reading between the lines, they do not want businesses to continue to purchase downgrade rights to Windows 7 when they purchase a new PC. Home users typically don't care and will use the operating system that comes with the computer, but business users normally can't be that easy going. 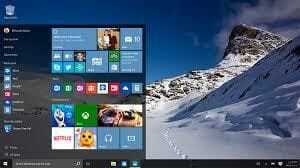 Yes, you will continue to receive critical patch updates for your Windows 7 or 8.1 operating systems but when you purchase a new PC, you will no longer be able to have Windows 7 or 8.1 installed from the factory, it will need to be Windows 10 after July 17, 2017. But what if you need Windows 7 because Windows 10 is not supported by your line-of-business applications? Microsoft will say "too bad". How can we beat Microsoft at their own game? If you are considering purchasing new computers or laptops in the coming year, you would be wise to purchase this equipment sooner rather than later. PCs and Laptops purchased with a 3-year warranty now will take you to January 2019 (within 1 year of the sunsetting for Windows 7). As we have seen recently with the Windows XP end of life, Windows 7 will become end of life in 2020 but, as with Windows XP, a smooth transition by the way of software compatibility will likely be available before Windows 7 becomes end of life in a little under 4 years time. Loyal I.T. Solutions can still purchase PCs and laptops with Windows 7 and Windows 8.1 installed from the manufacturer, so if you are in a position where you are thinking about updating your hardware, give Naomi at our office a call on 02 4337 0700 or drop her an email at reception@loyalit.com.au and we will be able to assist with the planning for your transition to new hardware, whether it be Windows 7, 8.1 or 10. Today, Microsoft launched it's latest desktop operating system offering Windows 10. 4 of us have been running Windows 10 here at our office for a few months. Let me tell you, the experience to date has been well above expectation. Windows 10 installs quickly. The upgrade from Windows 7 or Windows 8/8.1 is painless. Once upgraded, the operating system loads quickly, the Start Menu is back, drivers are well supported and it is easy to drive and use. Microsoft has looked at what everyone liked and hated with Windows 7 and Windows 8 and made sure they resolved the issues. Thankfully, this means the start menu returns. It combines the good bits from Windows 8 as well as the bits we missed from Windows 7. For those of you who have suffered with Windows 8 or 8.1, Windows 10 will be a welcomed arrival. Due to the ground Microsoft lost with Windows 8, they are offering Windows 10 to all users that hold a valid Windows 7 or Windows 8 license. I feel that this is a generous offer that will see many users move quickly to the operating system. If your system is eligible, you will see a Windows icon in your system tray offering the free upgrade. 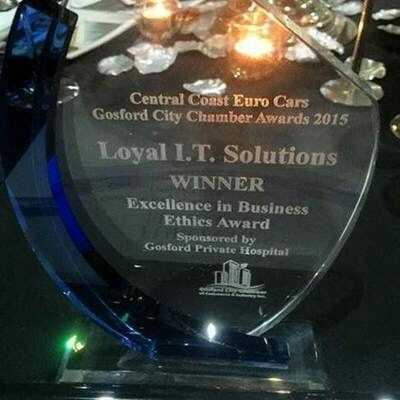 Last Saturday night, the Gosford Chamber of Commerce held their annual business awards. Loyal I.T. Solutions was nominated in two separate categories Excellence in Business Ethics and Business Leader. I am happy to announce that we won the Excellence in Business Ethics award. We had won this the previous year, so we remain the 2015 title holder. Congratulations to Ian Stewart who won the Business Leader award. I am really proud of winning the Excellence in Business Ethics award. Thank you to all of our loyal clients that support us! One again, Loyal I.T. is getting involved in Zoo and Snooze. This is the major fundraiser for the year for Coast Shelter. Coast Shelter do awesome work on the Central Coast. Their goal is to end homelessness on the NSW Central Coast. Zoo and Snooze is an executive sleep out, where each sleeper needs to raise $1000 to sleep rough at the Australian Reptile Park. This is on Friday 7th August. We are a team of 7, so our goal is $7000. A special thank you to Michael Trimblett, Naomi, Raewyn, Brendan Cairns, Sarah Russell (from the NSW Cancer Council) and Shayne Price (from Custom Outdoor Creations). We are currently sitting at $4366.07. Thank you to all of our clients that have donated to this great cause. If you would like more information about Zoo and Snooze, or make a donation, please check out the Zoo & Snooze website. If you would like to know more about the great work that Coast Shelter perform in our local community, please visit the Coast Shelter Website.